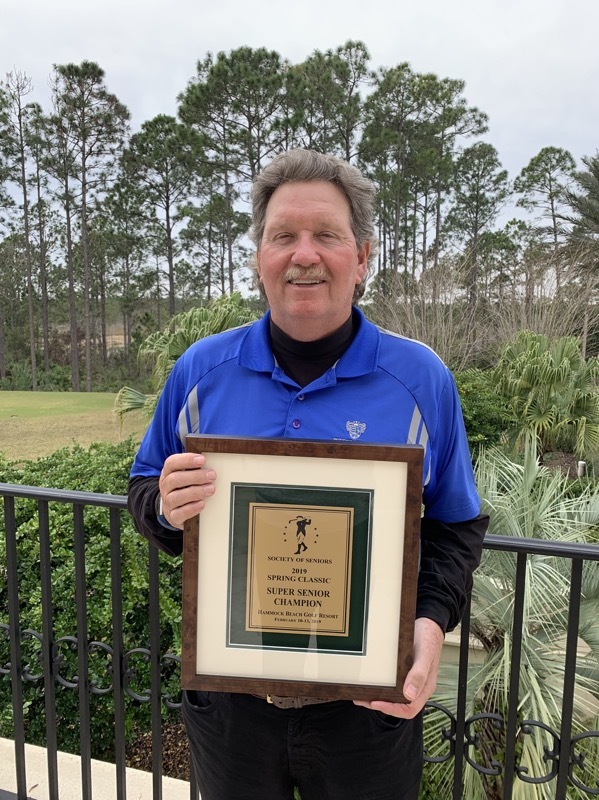 Jim Lehman, Plymouth, MN, started the final round of the 2019 Spring Classic one shot back of Windermere, FL’s Mark Weston. Lehman posted five birdies on the final day, good for a three shot victory over Richard Kerper, Oldsmar, FL. The windy links of the Conservatory Course at Hammock Beach was the setting for the annual spring coming out party. The Conservatory Course is a breathtaking setting from the mind of British Open Champion Tom Watson. The course includes waterfalls, stone fieldwork, sod faced bunkers and more than 140 sand bunkers and coquina areas. If there was a prize for “Who came the furthest to play” it would have belong to Greg Sanders. Coming a mere 4,709 miles from Anchorage, AL (that’s Alaska, not Alabama, for those guys from Michigan) to compete in his first SOS event, Sanders not only showed up, but put up with an opening round 69. If anybody is keeping score, it is a 91-hour drive from Anchorage to Palm Coast. 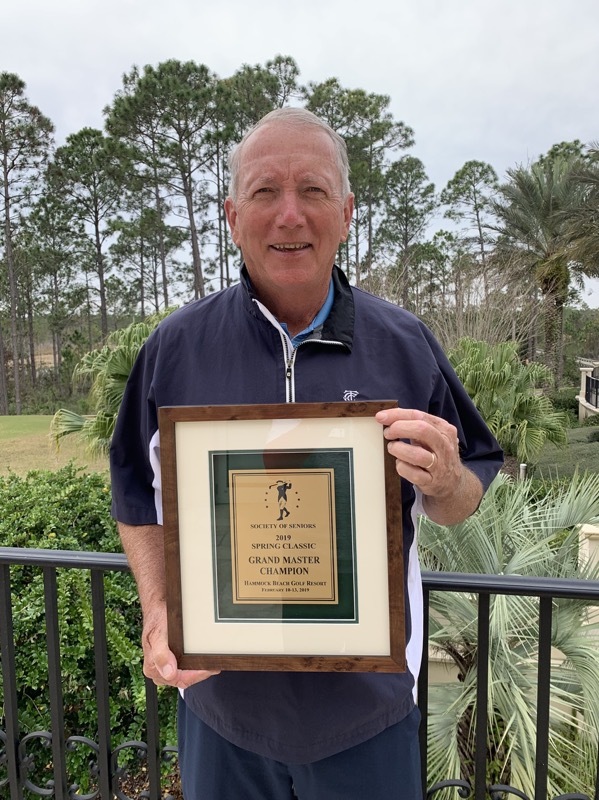 Also posting a 69 in the first round was 2018 Senior Masters Champ Peter DeTemple, Lexington Park, MD. Lehman and Weston were one shot back at 2-under 70. Sanders and DeTemple’s second rounds of 75 (144) and 76 (145) respectively brought the field tighter for the final round. Weston followed his opening 70 with a nice 73 (143) to take the overnight lead to Wednesday. Kerper added a solid 72 in his second round (145). Lehman, the 2013 SOS Spring Classic Champion, started the last round slowly with a bogey on the second. But four birdies on the next nine holes, and a finishing birdie on the par 5 18th sealed the deal for 2 times Minnesota Senior Amateur Champion with a 213 total. Kerper and Keith Decker, Martinsville, VA fired closing 72’s to finish second (217) and third (219). Stephen Fox, Barboursville, WV was the story on day one with a brilliant 2-under par 70 in the wind. Bill Barnes, Bonita Springs, FL was nipping at his heels with a fine 71 to start. 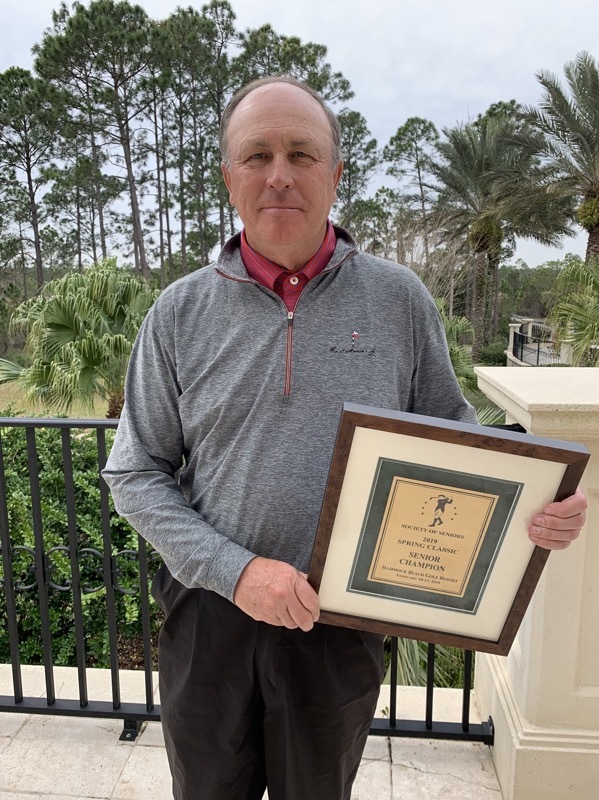 Barnes, the 2018 Florida Senior Amateur Champion, added another steady 71 (142) in round two to take the 36-hole lead. Marc Fried, Solon, OH a past Club Champion of the Hammock Beach Club found himself in contention with a second round 72 (148). Cincinnati’s Phil Russo, was next at 149 with Richard Pfeil, Lake Geneva, WI at 151. Pfeil’s closing 69 was impressive, but not quite enough to make up the necessary ground on Barnes. Barnes posted a 75 that included birdies on the par 5 9th and par 5 18th holes. His 217 total was three better than Pfeil (220), six better than Russo (223) and Fried (223). After 54 hoes of regulation, John Osborne, Vero Beach, FL and Jim Grubbs, Austin, TX were tied at 6-over par 222. With the weather worsening and planes to catch it was decided to declare both as co-champions. Rusty Napier, Shalimar, FL, only matched Osborne’s first round 73. Jim Kamis, Marietta, GA and Pete McDade were deadlocked at 74. Grubbs was just barely within shouting distance with a 5-over par 77. Osborne added a 75 in round two (148) as did Napier (148). Kamis kept it interesting by adding a 76 (150). Grubbs made his move to post a 74 (151). Grubbs managed to make three birdies against two bogies (71) in the final while Osborne struggled to match two birdies with four bogies (74). At the end the two were deadlocked for the top position. It was then decided by both players to accept as co-champions.